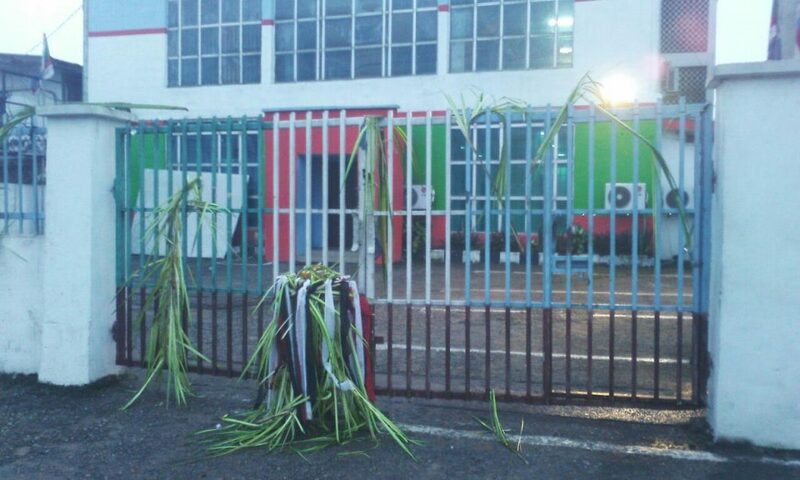 The crisis rocking the All Progressives Congress, APC, in Ondo state took another dimension early Monday morning as unknown ritualists locked up the state party secretariat located at Oyemekun road in Akure. 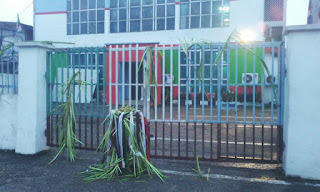 People who was at the secretariat, observed that the suspected ritualists put Ogun shrine at the entrance gate to the office. It will be recalled that two weeks ago, some aggrieved party members led by Bar. Tolu Babaleye and Hon. Saka Yusuf Ogunleye had locked up the party secretariat preventing the party chairman in the state, Hon. Isaac Kekemeke, from entering the office. The aggrieved group were upset over the alleged moved by a national leader of the party, Asiwaju Ahmed Tinubu to impose one of the governorship aspirants in the party, Mr. Segun Abraham, as the party candidate. They also accused the party chairman of moving around and using the party organ to solicit support and votes for Abraham ahead of the party primary election slated for September 3. Already, the state executive members have removed Kekemeke over these allegations, but the national body said it is not aware of Kekemeke’s removal. Those behind the fetish incident at the party secretariat allegedly did that in order to prevent the embattled chairman from holding the state Executive Committee meeting at the secretariat slated for today. Kekemeke did not respond to his phone calls as at the time of filing this report.